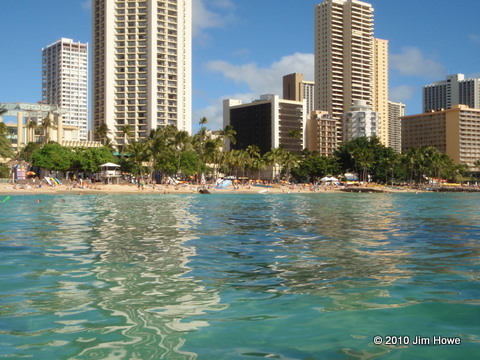 Kuhio Beach Park lies between the Sheraton Moana Surfrider Hotel and the Kapahulu Groin. Prior to 1951, the east end of the park was fronted by a shallow reef and was called "Stonewall" for the vertical seawall that supported Kalakaua Avenue. The Waikiki Beach Improvement Project, completed in July 1951, changed the area dramatically when James W. Glover, Ltd., constructed a large pedestrian groin into the ocean. Officially known as the Kapahulu Groin, the pier is an extension of a storm drain that runs under Kapahulu Avenue. The project also included constructing the low retaining wall on the Diamond Head side of the groin and importing sand to create the beaches on both sides. Kuhio Beach Park was named for Jonah Kuhio Kalanianaʻole, the youngest son of Kekaulike Kinoiki II and High Chief David Kahalepouli Piʻikoi. Born on March 26, 1871, at Hoai, Kualu, in the Koloa district on Kauaʻi, his mother died soon after his birth. He and his two older brothers were adopted by Kapiolani, his mother's sister. Kapiʻolani and her husband Kalakaua had no children, so when Kalakaua became king in 1874, he gave each of the boys the title of prince. In 1893, a revolution deposed Queen Liliʻuokalani, Kalakaa's sister and successor. In 1895, Prince Kuhio and other Royalists joined Robert Wilcox in an unsuccessful attempt to overthrow the Republic of HawaiʻI and restore the queen to her throne. Prince Kuhio served one year in jail as a political prisoner. He was released on October 8, 1896, the same day as Queen Liliʻuokalani and other Royalists who had also been arrested. In 1902, Prince Kuhio was elected Hawaiʻ's second delegate to Congress and served until his death in 1922. He is best remembered for his efforts to help the Hawaiian people, and in 1921 he was successful in establishing the Hawaiian Homes Commission Act, a measure that opened public lands in HawaiʻI for homesteading by native Hawaiians. Kuhio Beach Park was the site of Prince Kuho's home, Pualeilani, or "flower from the wreath of heaven," where he lived with his wife Princess Elizabeth Kahanu. On July 22, 1918, he removed the high board fence around his home and opened this section of beach to the public. When he died of heart disease at Pualeilani on January 7, 1922, the property was given to the city. It was officially dedicated as Kuhio Beach Park in 1940. Waikiki's two famous surf sites, Queen's and Canoes, are off the west end of the park. Queen's was named for Queen Liliʻuokalani, who had a beach home and a pier inshore of the site, and Canoes was named for the outrigger canoes that are still used to surf its waves today. Waikik's beach boys also teach visitors how to surf at Canoes, one of the best beginner's spots in Hawaiʻi. Kuhio Beach Park is the site of three well-known landmarks, the Stones of Kapaemahu, the Duke Kahanamoku Statute, and the Prince Kuhio Statue. The stones represent four legendary men, Kapaemahu, Kahaloa, Kapuni, and Kinohi, who came to HawaiʻI from a distant land. They were famous throughout the islands for their powers of healing and for their great wisdom. The Duke Kahanamoku statue, created by sculptor Jan-Michelle Sawyer, was dedicated on August 24, 1990, the 100th anniversary of the Duke's birth. One of the greatest sports heroes in HawaiʻI, Kahanamoku is recognized internationally as the father of modern surfing. The statue of Prince Kuhio, created by sculptor Sean Browne, was dedicated on January 12, 2002.